It is that time of year when thoughts are turning towards the interior spaces of your home and your office. Knoll’s annual sale offers 15% off + free shipping on all their iconic furnishings by designers such as Harry Bertoia, Marcel Breuer, Alexander Girard, Eero Saarinen, Mies van der Rohe and so many more. The Saarinen Dining Table (available in round and oval) was designed by Eero Saarinen in 1957. Eero Saarinen vowed to address the "ugly, confusing, unrestful world" he observed underneath chairs and tables - the so-called "slum of legs." A five-year design investigation led him to the revolutionary Pedestal Collection. More Marble: Saarinen Marble Dining Tables are now available in 96-inch lengths. The very graceful Bertoia Diamond Chair, designed in 1952, is an astounding study in space, form and function by one of the master sculptors of the last century. 100 years young. 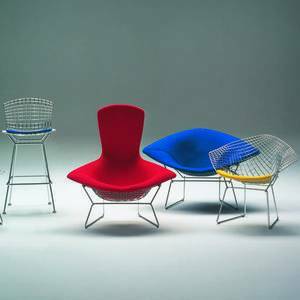 Knoll is celebrating Harry Bertoia's 100th birthday. The Bertoia Diamond Chair is available in 3 size options and a host of amazing Knoll fabric options. Club Classic Redux. The 1925 Wassily Chair is available in 27 Spinneybeck® belting leather colours, and cow hide and hair hide options. For your office. The Knoll ReGeneration Chair is innovative in its simplicity. ReGeneration minimizes materials and components. The straightforward design leverages flexible, durable and sustainable materials that respond to your movements, providing comfort and support throughout the day. With so many options to customize to your exact requirements the Knoll ReGeneration Chair is a great choice for all your office needs. Out of the Ordinary! Saarinen Tulip Chairs surprise guests in Jean-François Fourtou's Marrakech studio. The surrealistic sense of scale that characterizes Fourtou's art work invokes a child-like state of wonder. Eero Saarinen's Tulip Chairs at Jean-François Fourtou's home in Marrakech, Morocco. Photograph by Richard Powers. This entry was posted in Uncategorized, Seating & Chairs, Design & Decorating, Living & Rec Room, Kitchen & Dining, Sales and Promotions, Multi-use Chairs and tagged Knoll, knoll sale, Knoll Saarinen Marble Dining Tables, Knoll Bertoia Diamond Chair, Knoll Wassily Chair, Knoll ReGeneration Chair on September 21, 2015 by Christine Toller. David Trubridge, a transplant from the north of England to New Zealand, has been making unique, eco-friendly lighting since 2003. Because the company is based in New Zealand, their remote location has necessitated creative solutions to distance and freight issues and they have developed “kitset” products to address these problems. Lights come ready to assemble. The David Trubridge Coral Pendant Light's form is based on the structure of a geometric polyhedron. Every piece is identical, making home assembly easy. The way it grows outwards with fingers reminds David of snorkeling over reefs, exploring all the various coral shapes. There are 13 colour options available and 6 sizes. The David Trubridge Floral Pendant Light is based on the shape of a flower from Western Australia. Available in 5 size options and 13 colour choices. Snowflake is based on David's time in the Antarctica. It is available in 2 sizes. David Trubridge's Manuka Light came about from David’s observations of the delicate white flowers of the native New Zealand Manuka tree. Available in 2 sizes. These David Trubridge lights on display at the ORA Gallery in NYC include a wonderful cascade in the front window and also large sized lights the main gallery. The lights create phenomenal shadow patterns, garnering the attention of the many pedestrians who walk down 7th Avenue. Sustainability is a prime focus of David Trubridge. When a company says it is 100% sustainable, carbon neutral or green, David is concerned about "green washing". By manufacturing all their products in their own factory they can control all processes. How the operations impact on the environment is intertwined with how David Trubridge designs and make decisions. This entry was posted in Uncategorized, Design & Decorating, Lighting & Lamps, Green & Eco-Friendly, Sales and Promotions and tagged David Trubridge, David Trubridge Coral Pendant Light, David Trubridge Floral Pendant Light, David trubridge Snowflake Pendant Light, David trubridge Manuka Light on September 15, 2015 by Christine Toller. Celebrate the inherent beauty of this popular wood with the new walnut editions of the Eames Hang-It-All and the Nelson Platform Bench. The Eames Hang It All is available in walnut, black, white or multi-coloured balls. The Hang It All is great for hallways, bathrooms, kid's rooms and anywhere you need to add function and fun. Introduced in 1946, the Nelson Platform Bench is a versatile piece that is a multipurpose resting place for people and their things. With it's simple spare lines, the bench is a piece of art in itself that has become a sought after collector's item for use in a living room, vestibule, bedroom, library, office, or public area. Walnut develops a dignified patina over time, making each of these classic designs unique and timeless. Here are some Herman Miller heirlooms that have changed with the times. Make lounging a noble pursuit. This classic 1956 Eames Lounge Chair and Ottoman is considered one of the most significant and widely recognized furniture designs of the 20th century. The Eames Lounge Chair and Ottoman is available in two sizes and different wood and leather options. The Eames Walnut Stools are available in three distinctively different sculpted profiles. Besides being places to sit on, they also serve as low tables, display surfaces, or simply objects to be admired. The Noguchi Coffee Table was designed in 1948 by Isamu Noguchi. Each table is signed on the glass and is available in different wood bases. Set the Tone. Set the Table. Build a dynamic dining room with walnut’s majestic marbleized grain. The Nelson X-Leg Table, 1950, is a dining table that also functions as a work table. 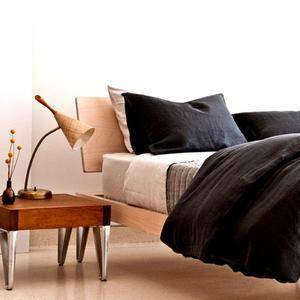 Two depths and three widths allow you to pick just the right size for your space. Available surface options include richly hued walnut, the clean look of white ash, and deeply patterned Santos Palisander. This entry was posted in Uncategorized, Seating & Chairs, Design & Decorating, Accents & Accessories, Kitchen & Dining, Product Launch and tagged herman miller, eames, Eames Lounge Chair, Nelson Platform Bench, Eames Hang It All, Eames Walnut Stool, Noguchi Coffee Table, Nelson X-leg Table, Herman Miller Walnut on September 9, 2015 by Christine Toller.